Too many plastic bags end up as litter. 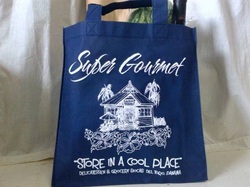 To keep this archipelago a little cleaner and enhance it's beauty, Super Gourmet introduced reusable fabric grocery bags in 2010. We try to promote sustainability to keep the island and it's surrounding waterfront clean. Bags can be bought at the cash registers. Trash collection and litter is a problem in our small community. As part of our commitment to the communicaty our staff and partners drive the private recycling truck through the whole town monthly for glass, cans and plastic pick-up. 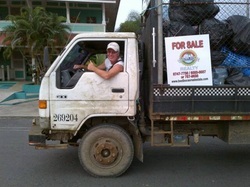 We try to keep our solid waste to a minimum and look forward to a cleaner Bocas del Toro. In early 2013, Super Gourmet introduced a Pristine Water drinking machine to help stop over-use of small plastic water bottles on the island and globally. The machine features a five level filtration system and the water tastes great! 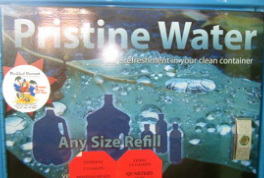 Reduce, refill and refresh yourself by filling a bottle (.25/L : 2L-5 gallon bottles accepted) any time the store is open! Each week Super Gourmet prepares soup for the local hospice. 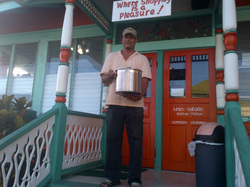 We deliver the soup and hope that it warms the bellies of the less fortunate on the island.